You may have noticed I haven’t been blogging nearly as much lately, San Diego Beer Week took it’s toll again this year, I think I went about a week without even thinking about beer let alone drinking it. Then I went down to San Felipe for Thanksgiving (where the above photo was taken). I’ll slowly be getting back into the swing of things over the next month but posts will still be sporadic through the holiday’s as life and work get in the way of beer drinking and blogging. I hope to update the Events Calendar soon, there’s plenty of great stuff going on. The third annual San Diego Beer Week gets underway in just a couple of days, and I have to say, the amount of events is nearly overwhelming. As of this writing there are 391 events posted on the official site, with at least a handful of other events that I know of not posted to the site for one reason or another. My friends/colleagues over at West Coaster also have a similar guide posted, there’s some overlap between events there and here, but not much. Be sure to check out their take on the things going on during SDBW as well. 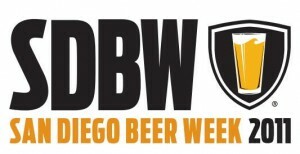 As you can probably tell, the Events page here at San Diego Beer Blog isn’t being updated with San Diego Beer Week info, it’s just too much work to duplicate the info on the official site. 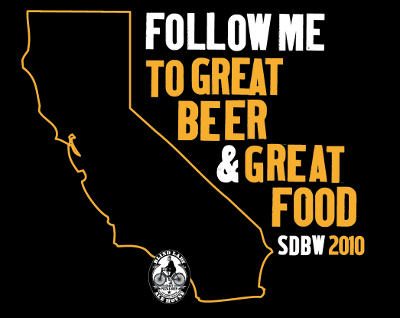 So if you want to know all of the events going on, head on over to the SDBW events page. One final note, as far as I know there isn’t an official smartphone app for SDBW, but there is an unofficial SDBW Planner web app. I’ve tested it out a bit and it seems to work well, you can browse events, add them to your schedule and if your Facebook or Twitter friends are using the app you can see which events they have added to their schedule. Now, on to the list! SDBW doesn’t officially start until Friday, but Blind Lady Ale House and Tiger!Tiger! are getting a head start on the action. They’ll have Tomme Arthur of Port Brewing and the Lost Abbey at Blind Lady Ale House leading a flight tasting of six of his beers starting at 5pm. Over at Tiger!Tiger! they’re showcasing beers from new LA brewery Golden Road. 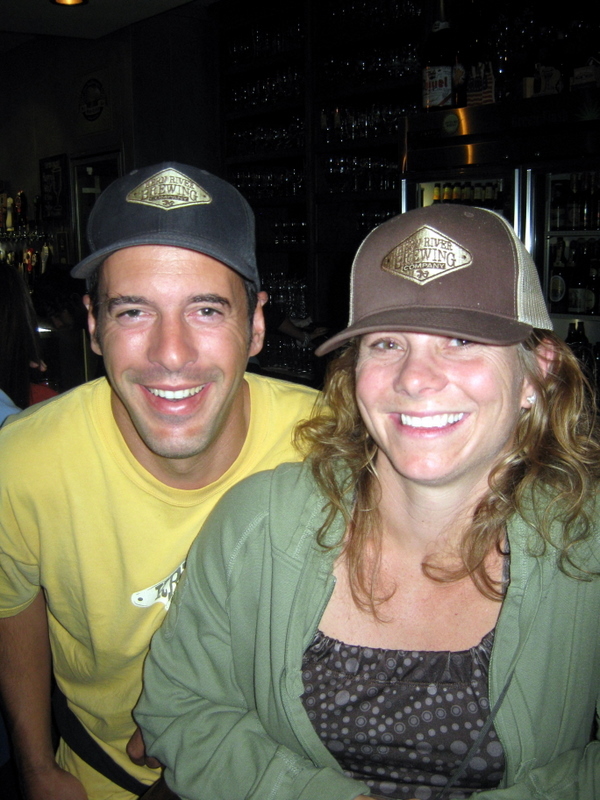 Golden Road was founded by Tony Yanow (proprietor of the LA beer bar/restaurants Tony’s Darts Away and Mohawk Bend) and Meg Gill (formerly of Speakeasy and Oskar Blues) and the beers are brewed by Jon Carpenter (formerly of Dogfish Head). There’s a lot of potential for this new LA brewery, and as far as I can tell this is their first time in San Diego. Hamilton’s Tavern kicks off SDBW with a solid lineup from Karl Strauss for Firkin Friday. They’ll have the GABF Bronze medal winning Two Tortugas Belgian Quad on draft as well as on cask with bourbon soaked oak in addition to other treats like Heavy Petti DIPA, Off the Rails and plenty of other Karl Strauss beers. Down at Downtown Johnny Brown’s they’re doing their third annual Barrel Aged Night. Last year I was shocked with the number of great beers on tap and how relatively un-crowded it was. 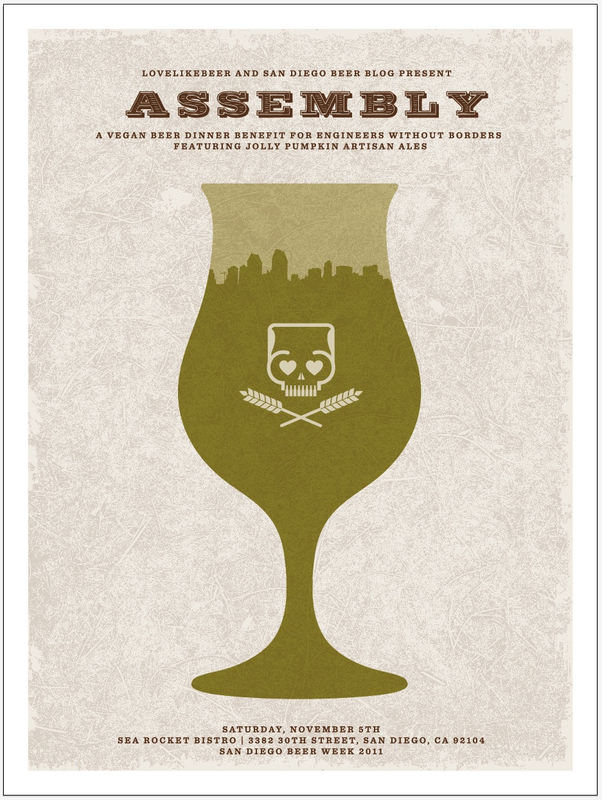 Check the event page for the beer list (which is still growing). The Brewery’s Guild Festival at Liberty Station might be the one don’t-miss-event of San Diego Beer Week. Nearly every San Diego brewery is in attendance with some of their best beers. There’s a VIP session with the really good stuff starting at 11am with General Admission from 1-5pm. Buy tickets in advance here. There will be a few chances to try Dogfish Head’s much sought after 120 Minute IPA during San Diego Beer Week but the first (that I know of) will be at Hamilton’s Tavern. (The others are at O’Brien’s Pub on Monday and Neighborhood on Tuesday). They’ll have other DFH beers as well. Bison Brewing’s Organic Chocolate Stout is a long time favorite, and during SDBW they’ll be unveiling Bison Bourbon-Aged Chocolate Stout for the first time. Starting at 6pm at Bottlecraft they’ll have both the barrel aged and regular versions on draft to taste side by site. I’m told the event is being organized by a group of female beer bloggers from around the country and there will be some homemade treats to pair with the beer as well. Blind Lady will be featuring some of the beers from Durango’s Ska Brewing Company (an old favorite of mine) as well as showing the movie Dance Craze, a documentary from 1981 about ska music in England. BLAH’s kitchen will be closed by MIHO Gastrotruck will be outside serving food. Stone is hosting special SDBW edition of their Beer U series entitled, Beer U: Intro to San Diego Craft Beer which will feature beers from some of the newer San Diego breweries. Buy tickets in advance as the Beer U classes often sell out. Wish you could get more Silva Stout? Now’s your chance, no Green Flash isn’t releasing a new batch of Silva Stout but they’re pulling some bottles out of the cellar for one night only. $45 tickets include a 4-pack of Silva Stout to take home, four barrel-aged beer tasters, commemorative glass and a food pairing. At the National Homebrewer’s Conference in June I got to taste a a handful of beers all made with the exact same recipe and then split into different carboys and fermented with different yeast strains. This is a great way to see just how much the type of yeast determines the flavor of the beer. Lucky for you White Labs is doing the same thing and holding a demonstration at Sea Rocket Bistro. They’ll have three beers all with the exact same recipe fermented with three very different yeast strains. Neva Parker Head of Laboratory Operations will be on hand to discuss the variations in the beers. Hors d’oeuvres will be served throughout the evening. Oskar Blues is known for being the first craft brewer to put their beer in cans. For whatever reason their beer doesn’t make it out here on draft too often, but at The Tipsy Crow they’ll have a handful of Oskar Blues beers, most of which don’t get canned at all. Many of them are variations on their regular line up, the one I’m most looking forward to being Barrel Aged 2010 Sour Cherry Ten Fidy. I haven’t yet had Four Calling Birds, the latest in The Bruery’s annual Twelve Days of Christmas series, but early reports are that it’s really good. Local Habit will be tapping a cask of it at 4:30pm and they’ll have other beers from The Bruery on tap as well. I was tempted to not post this next event out of selfishness, I mean, Small Bar’s name is pretty literal and this event is already flying under the radar it seems, but journalistic integrity won out. Celbrated Ales is a local distributor that brings us some very awesome beers from some smaller and less well known breweries. They’ll be showcasing some beers at Small Bar including Gueuze Tilquin on draft (I believe Tilquin is the first new Gueuze blender to open in Belgium in the last fifteen years) along with bottles of Midnight Sun Treat, some barrel-aged offerings from Stillwater and more. Barrel aged beer nights are always a ton of fun. Most of these a beers that can be aged, so bars typically stockpile some of the best for their showcase night. Just like Downtown Johnny Brown’s the previous Friday, Roll out the Barrels at O’Briens shouldn’t disappoint. They’ll have beers from local breweries and all over the country, aged in a variety of different types of barrels (nine different types as of this writing). Blind Lady Ale House is doing a handful of “Meet the Brewer” guided flight tastings, where the brewer is on hand to guide a tasting of the beers. (And if you can’t be there when the brewer is on hand, you can always get the flight afterwards). On Friday at 12:30pm they’ll have Patrick Rue of The Bruery with six of beers, a few of which won’t show up around town too often. They’ll have Burly Gourd, Oude Tart, Loakal Red, Birra Basta, Snicklefritz and Four Calling Birds. Night of a Million Zillion Speedways at O’Briens might just be the most anticipated event during all of SDBW. Last year it was crowded, lines ran down there street and parking was scarce. Once they got through the initial rush things slowed down and many of the Alesmith Speedway Stout varieties were still available. This year the fun starts at 5pm and they’ll have twelve different varieties including Kopi Luwak Speedway, Morita and Chipotle Pepper Speedway, a Mole (the Mexican sauce, not the animal) variety and more. Saison’s are one of my favorite styles, so I was excited to see Saison Saturday at Stone Brewing World Bistro and Gardens. There will be tons of different takes on the style with local Saison’s from the likes of Ballast Point and Lost Abbey as well as classics from Dupont and the always good newcomer Stillwater. I’ll admit that until last year I wasn’t too familiar with Mad River’s beers. Sure I’d seen Jamaica Red and the Steelhead line of beers around, but didn’t know much about them. Last year I stumbled into The Linkery and met head brewer Dylan Schatz and sampled some of their lesser known beers. All were well made and creative beers that we don’t see too often down here. There were big barrel-aged beers along with lower ABV more classic styles. The Linkery will have some food pairings as well. More info. Stone throws great festivals. From their long running anniversary festival to the newer Sour Fest and Oakquinox, they’re well organized and have amazing beer lineups. This newcomer to their festival lineup is Pour it Black, featuring some of the best stouts, porters and Black IPAs available. If you’re planning on going buy tickets in advance, these things usually sell out. Tuesday was Kern River Brewing Co. night at Toronado. Eric and Rebecca Giddens and Kyle Smith of Kern River were on hand and brought with them Just Outstanding IPA, Citra Double IPA, Class V Stout and Class X Stout. Just Outstanding IPA is well, just outstanding and since I had already had it before both bottled and on tap, I decided to skip it that night and try the other offerings. I chatted with Eric Giddens from the brewery for a while about it’s namesake mountain bike trail. And let’s just say a road trip to Kernville is being planned. I was most looking forward to the Class X Stout, and it did not disappoint. Class X Stout is the bourbon barrel aged version of Class V Stout, a respectable beer in it’s own right, and it was really interesting to be able to drink the two beers side by side. Class X Stout starts out as Class V Stout but is 100% barrel aged for eight months which changes the beer dramatically. Both were being served on nitrogen at Toronado, so it’s hard to compare them to other stouts served on CO2, but comparing them to each other was easy. The Class V Stout had a very strong roasted smell and taste. It wasn’t quite a coffee characteristic, but the roasted smell and flavor were very aggressive. The Class X Stout on the other hand smelled of bourbon and bourbon, vanilla and chocolate were all very apparent in the taste. It had some roasted characteristics but they were definitely more subdued than the Class V Stout. I would really like to try Class X Stout on CO2, so I could better gauge how well it stands up against other barrel aged stouts, because on nitrogen I have to say it is fantastic. Citra DIPA is another great beer from Kern River Brewing Co. My experience with Citra hops is limited, but this one is great. It has a big citrus hop smell and taste, it’s fairly fruity but seems to be more lemon or orange than the typical grapefruit flavors of a lot of IPAs. Wednesday night started at the new URBN pizza joint in North Park. They were holding a special media preview night at I had a few slices and some beer on the house. It was New English Brewing Co. night so I started off with a Trooper’s Tipple IPA. It’s an English style IPA which uses East Kent Goldings hops, it’s low in alcohol at 4.8% ABV and is fairly malty, but according to New English it’s a fairly classic example of the English IPA style. It was fairly light and refreshing, but I had to move on to something heavier next and had a Dogfish Head Chicory Stout. This 5.2% ABV has strong roasted and maybe even burnt flavors reminiscent of dark black coffee. It was bitter but not from the usual hop bitterness found in most beers. Chicory is used by some people as a decaf coffee substitute as it has a similar flavor which I think came through well in this beer. After URBN I headed down to Neighborhood where they were featuring The Lost Abbey and Port Brewing Company. I opted to go with the barrel aged again and ordered a Deliverance. Deliverance is a a blend of bourbon barrel-aged Serpent’s Stout and brandy barrel-aged Angel’s Share. I have never had Angel’s Share, and have only had non-bourbon barrel-aged Serpent’s Stout, so this was mostly new to me. Deliverance is good and is maybe my favorite beer I’ve had from The Lost Abbey so far (my experience with The Lost Abbey has been fairly limited, that is being rectified). It hada strong bourbon smell and taste, I couldn’t detect much brandy, along with roasted flavors from the Serpent’s Stout. The alcohol taste and heat was much strong on this than other barrel aged stout’s I’ve had. It was definitely a sipper and not something that could be drank quickly. That finally brings us to Thursday when I stopped into Karl Strauss in Sorrento Mesa for lunch where I had a SDBW Stout. This dry stout is around 5% ABV but is pretty flavorful. I’m a big fan of Imperial Stouts, and typically shy away from the lower ABV stouts, but I really enjoyed this. It’s brewed with Star Anise and has a slight liquorice flavor. The roasted barley flavors mostly overpowered the liquorice, but too strong of liquorice flavors could be too sweet. The body was a bit thin but I felt it had a great flavor, I would have preferred a bit more liquorice, but I’m probably in the minority on that one. The Bruery makes some seriously good beers. One of their beers, the 19.5% ABV Black Tuesday is much sought after among beer geeks. Brewed in small batches it’s fairly rare and can be quite difficult to get a bottle of . When recently put on sale on The Bruery’s website all available bottles were sold out within minutes. But if you haven’t had a chance to taste this beer Olive Tree Market in Ocean Beach has you covered. No, they won’t be selling bottles of Black Tuesday, but they are hosting a tasting with one of the brewers from The Bruery tomorrow (Wednesday, November 10th) with nine beers including Black Tuesday. The tasting runs from 4-8pm, but if you have your heart set on tasting Black Tuesday (or any of these fantastic beers) I recommend getting there as close to 4pm as possible. Olive Tree Market is located at 4805 Narragansett Avenue in Ocean Beach. The Park 2 Park Shuttle has teamed up with Says Granite for the Craft Beer Bonanza Shuttle during San Diego Beer Week, this Friday November 12th from 7pm-1am. And we’re giving away three pairs of passes. Just head on over to our Facebook page and leave a comment telling us which San Diego craft beer is your favorite. We’ll pick three winners at random Wednesday, Nov 10th at noon. Be sure to check back or leave your email address to see if you’ve won so we can get you the info for the passes. There are so many great events going on and this is a safe way to get around town. The shuttle will have stops near most of the awesome bars and restaurants in North Park, South Park, Normal Heights, University Heights, Golden Hill and even a few stops downtown. Check out the Park 2 Park site for all the details and to purchase passes if you don’t win. The shuttle is a great way to safely get around town while enjoying all the great beer events San Diego Beer Week has to offer. San Diego Beer Week is a big, diverse, decentralized event, which makes it mean a lot of things to a lot of different people. There are events with incredibly rare beers, events where you get to take a glass home, events with cheap beer, events pairing beer and food, you name it and there’s probably a bar or brewery doing it this week. 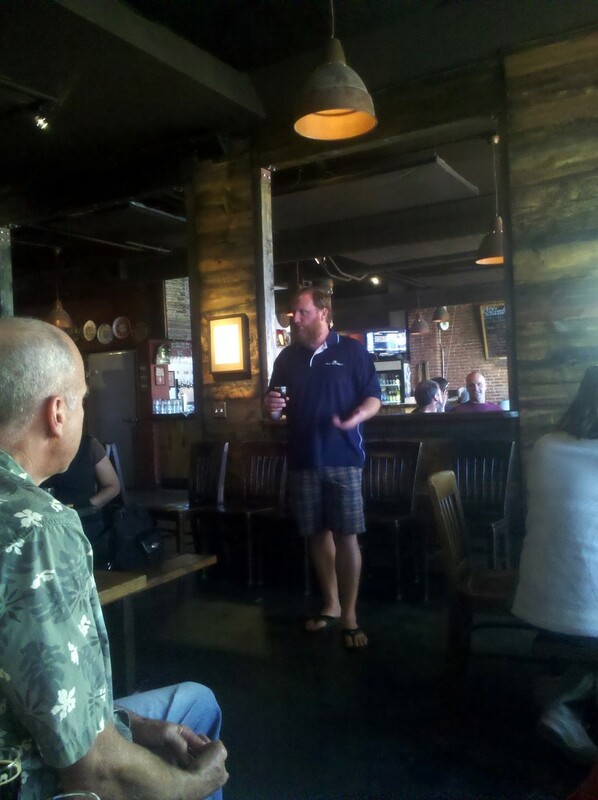 But in my opinion some of the best SDBW events are Blind Lady Ale House’s Brewmaster Series. For the Brewmaster Series BLAH invites brewers in to talk about their beer to a small group, typically less than 30 people. Everyone gets a tasting flight of six 5oz beers and the brewer guides them through each beer, discussing how the beer was made and answering questions people have. I’ve attended two of these Brewmaster Series type events, one with Patrick Rue of The Bruery a few months ago, and one this past weekend with Mark Jilg of Craftsman Brewing Co. At $25 they’re incredible deals, not only do you get to drink great beer but you get to hear about the beers from the people that make them. I can’t begin to describe how much I’ve learned at each of these events that I wouldn’t have had I just gone out and had a few beers. The flight alone typically costs $20 at the bar, so an extra $5 to listen to the brewer is quite a deal in my opinion. These tastings are a great way to learn an incredible amount about beer while drinking plenty of great beer with the folks that brewed it. Head on over to BLAH’s website to purchase tickets for each tasting.